With the iPad Mini 2019, Apple finally released a new and fifth version of its 7.9-inch tablet. At first sight, not much has changed because the design is the same as its predecessors. However, we’re getting a new A12 Bionic processor and Apple Pencil support. It starts at 399 US Dollars which makes it the priciest 8-inch tablet available right now. So, how good is it really? That’s what you’ll find out in my iPad Mini 2019 review. Let’s start with the design and build quality – and this is one of the few downsides of my review. The design of the iPad Mini 2019 did not change at all compared to pretty much all its predecessors. You might call it a classic design – but still. Especially when compared to the iPad Pro, the iPad Mini looks a bit old. The bezels around the screen are pretty wide and don’t look modern anymore. With that being said, we obviously do get a high-end build quality. That’s what Apple is known for. The Mini has a full aluminum body, feels like a premium device, and is just 6.1mm thin. With around 300g it also is very light. Underneath the screen, we get a Touch ID fingerprint scanner which doubles as the home button. The fingerprint sensor works fast and precise. On the bottom, Apple continues to use the old Lightning connector. That is very disappointing. I would have loved to see USB C here just like on the iPad Pro. Two speakers are located on the left and right side of the Lightning connector. Considering that this is a very small tablet, the audio quality is excellent. You can even hear a decent bass and the sound is clear. Sadly, the sound is coming out of one side of the tablet only. That means you won’t get any stereo feeling when watching movies. On the bright side, we do get a standard headphone jack. And, obviously, the iPad Mini also features a power button and volume controls. Like usual, there is no microSD card slot. The cameras offer a resolution of 7 and 8 megapixels. While the picture quality of the iPad Mini is not as good as with recent iPhones, it is very good for a tablet. The cameras are better than the ones of most competitors. It’s certainly good enough for Skype and the main camera is detailed enough to scan in documents with or to take snapshots. Like its predecessors, the iPad Mini 5 has a 7.9-inch screen with an aspect ratio of 4:3. It has a resolution of 2048 x 1536 pixels. Even though that is the same resolution as the last couple of generations, it is still high-resolution enough. Texts look very sharp and it is a great screen to read books with. All other aspects of the display are very good too. It is an IPS panel with wide viewing angles. Oh, and the screen is fully laminated. That means there’s no air gap like we’ve seen with the standard 2018 iPad. It is very bright with 500 Nits and color reproduction and contrast are fantastic. It is the first iPad Mini that supports Apple’s True Tone technology. That means it adjusts the white balance of the screen based on its surroundings. That way the screen looks just like a real piece of paper would under warm living room lightning, for example. It is a nice feature, but you might want to turn that off when editing photos. By the way, the 4:3 aspect ratio is great for reading websites, books, or other documents. It’s a great format for that. However, because most movies are published in 16:9 or even wider you will see black bars on the top and bottom when watching Netflix or YouTube. I’ve mentioned it at the beginning already: The iPad Mini 2019 supports the original Apple Pencil. Yes, only the first original one. The Apple Pencil 2 is not compatible. You can use the Logitech Crayon though. Still, the original Apple Pencil is a good stylus. It is comfortable to hold, pressure sensitive, and even recognizes if you hold it at an angle. It might look a bit weird when you charge it with your iPad Mini – but well, at least it works. I think the iPad Mini and Apple Pencil are a great combination to use as a digital notebook. You know, as a paper replacement. The tablet itself is easy to carry around and the pen works great. No competitor is offering something similar right now. There’s one negative thing I noticed. If you use the Apple Pencil on the touchscreen it clearly feels like writing with plastic on glass. You don’t get that feeling from pens from Samsung or Microsoft because their tips are softer. To fix it, you can get a special kind of screen protector though. Inside the iPad Mini 5 runs the exact same Apple A12 Bionic processor that was introduced with the iPhone XS. Additionally, we get 3GB of RAM and a 64GB or 256GB internal storage. If you want, you can also buy it with built-in 4G LTE. Yes, the A12 is not as powerful as the A12X of the iPad Pro. But still. The A12 is faster than what we’re seeing in all Android tablets currently available. As you can see in my benchmark comparison, the iPad Mini gets fantastic results. I think it will be the fastest 8-inch tablet for at least one to two years because Samsung and Huawei tend to use older chips in their tablets. As I said, we know the A12 from current iPhones already. So, as you might expect, the performance is great in real life too. The iOS operating system and all apps run very nicely. I’ve surfed the web with a lot of tabs in Safari and used Word and YouTube in the split-screen-view at the same time. Everything runs smooth. The performance is good enough to use professional apps like Adobe Lightroom, Affinity Photo, and LumaFusion too. With those, you can edit photos and videos almost like you can with Desktop PCs. It’s impressive to see that you can do that with such a small tablet. In my gaming test, the results are great too. Games like Fortnite and PUBG Mobile run very smoothly and look nice. In fact, the graphics of PUBG Mobile look more detailed than on the Huawei MediaPad M5 8 which is one of the fastest Android tablets. Obviously, every game should run on here because it’s the same iPhone XS hardware. Apple is shipping the iPad Mini 2019 with iOS 12 which is the newest version. Based on the past, it will be kept up-to-date with updates for many years. And, unless another manufacturer changes their behavior completely, it’ll be up-to-date longer than all current Android tablets will be. Windows tablets are kept up-to-date long too of course. By now, I really like iOS. It runs very smooth, looks modern, and gets better with every new version. In the last couple of years, a lot has changed especially for iPads. By now, you can open two apps side by side to get real multitasking. And the drag and drop feature works great too. The iPad Mini supports all the gestures for the Dock or Quick Settings like we’re used to from other iPads. Another reason why iOS is great is its app ecosystem. There are tons of apps that are specifically optimized for iPads. Sure, a lot of games and apps like Microsoft Word and Adobe Lightroom look identical on most systems. However, when you look at niche and professional apps, there are some that iOS offers but Android does not. I already mentioned Affinity Photo and LumaFusion. Obviously, you can get similar apps for Windows and macOS but Android is lacking apps like this. Most of the time I like iOS. However, sometimes Apple’s restrictions can be very frustrating. For example: While we do get a files app, we don’t get real access to any kind of file system. Sure, most of the time you don’t need that. But sometimes you might. For example, when you want to import videos from an SD card that were recorded with a Sony camera. A real back button would be great too. Still, overall, I think the software of the iPad Mini is very good. Most things like the missing access to the file system are more an issue of the iPad Pro. You probably won’t replace your working machine with the Mini, so it’s not too bad. The battery life of iPads has always been pretty good and that goes for the iPad Mini 2019 too. In my battery test, it got a runtime of 12 hours and 15 minutes. For this test, I’m always looping an HD video at medium brightness. My comparison shows that its battery life is not as long as the one from the iPad Pro. But still, overall, it’s a great result. Alright, this is my iPad Mini 5 Review. Is it a good tablet and can I recommend it? Yes, of course, I can. It is the best 8-inch tablet you can buy right now. The iPad Mini is faster than all competitors of a similar size. At the same time, the display is very good, the speakers sound nice, we get solid cameras, and Apple Pencil support. Additionally, Apple will release updates for a long time and there are tons of apps developed specifically for iPads. Yes, from the front, the iPad Mini does not look new. But its thin metal body does feel high-end. It would have been nice to see Apple switch to USB C completely. But well, no tablet is perfect. Let’s check out some possible alternatives. If you are looking for a better 8-inch tablet: There is none. In fact, there is only one tablet that kind of plays in the same league. It’s the Huawei MediaPad M5 8. While it is not as powerful, it still is fast enough and costs a lot less with around 300 Dollars, depending on the market. It features a high-resolution screen, a metal body, and a fingerprint scanner too. However, it does not support any kind of active pen. A much weaker but cheaper alternative with an active pen is the Samsung Galaxy Tab A Plus 8.0 with S Pen. I did not review that one yet though. 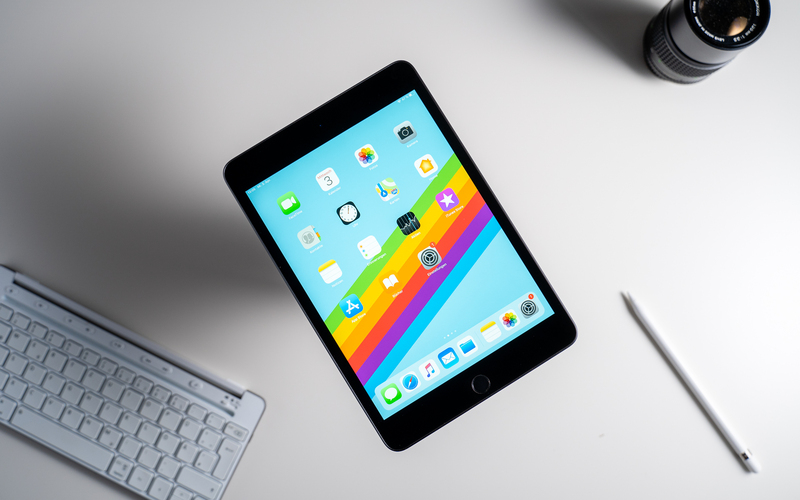 Apple iPad Mini 2019 Review:The Apple iPad Mini 2019 is the best 8-inch tablet you can buy right now. It offers an outstanding performance, a pretty screen, a long battery life, and a great build quality. Other features like its speakers, cameras, and fingerprint scanner are good too. Oh, and Apple Pencil support is fantastic. However, I wish Apple would switch to USB C.